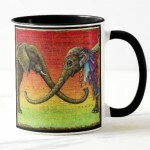 Zazzle is where you’ll find mugs, puzzles, & other items that I can’t produce in my own studio. I’m always adding more images & products, so please feel free to contact me if there’s anything you would especially like to see there & I’ll do my best to provide it! As always, prints and originals are available via my Etsy shop. Only a small selection is shown below. If you don’t see what you’re looking for here, please click through directly to CuriousArtLab, where you’ll find many more! This entry was posted in Shop on 11December 2018 by Leah. Do you have a large poster of the letters of the alphabet? If you mean the A Word A Day alphabet, not yet, but it’s a good idea! Not sure I could get it going before January though, because things are crazy around here these days! I do have a largish one of my first curiotype alphabet. It’s not archival though. What lovely, imaginative artwork you do! Please tell me whether/when/that you sell notecards, say, 4 x 5 inch folded or similar. I could certainly think of friends who would love a pack of 12 or so as a gift. Would love to see your work on an ornament, too. 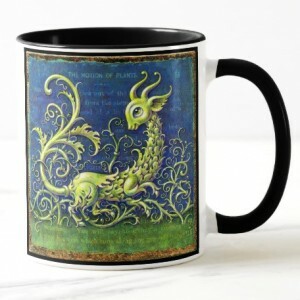 (Zazzle or Cafe Press, for example) Have you considered doing a calendar or coffee mug? These would be the world’s coolest monogram ever. Thank you so much, Jody! Several people have asked me about cards & such, but at the moment I don’t have any for sale. I’d looked into printing them, but it wasn’t a practical option at the time. However, all the interest is making me rethink this, so I may just set up a few options on Zazzle or Cafe Press! Would you like to be on my mailing list so I can let you know if I do? If so please send a request through the contact form or you can just leave your email here in comments if you prefer. 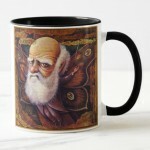 Are there any particular images you’d like to see on cards, mugs or ornaments? 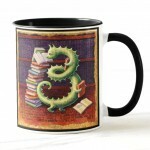 Thanks to your comment (& a few others), I’ve decided to take the plunge & put Bibliophile mugs up on Zazzle! I’m not doing cards there because I wasn’t impressed with their format choices, but I may try other products, & if there are other images that interest you, please let me know!